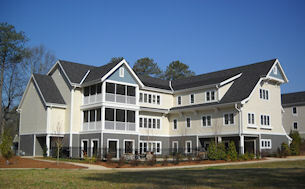 The Green House model takes the institutional, large-scale approach to delivering assistive services to seniors and transforms it into residential-looking small-scale buildings that blend into urban and suburban neighborhoods and provide a home-like environment and assisted living to households of 10. 50+ Housing Council members know that the average age for moving to an active adult community has been steadily climbing, and many residents, having chosen a lovely, user-friendly home, want to stay as long as they can — which means that they're interested assistive services as they age. 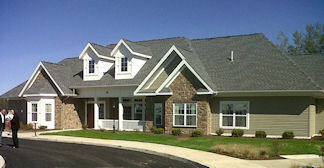 NAHB staff looked at the Green House approach and saw it as a possible opportunity for member developers and builders to include such services in their active-adult communities, or to use their expertise in residential building to diversify their businesses by producing such facilities for nursing homes or CCRCs. In conversation with representatives from the Green House Project, we learned that no active-adult builder had yet approached them about such an project, but they were intrigued by the possibilities. This story explains what they do, in their own words. No one driving around the Arbor Ridge neighborhood in Rochester, N.Y., would ever guess that the community is home to one of the most innovative skilled-nursing care centers in the nation. That’s because no one is supposed to notice it. 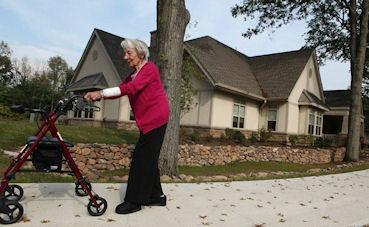 The nursing care centers are designed to blend into the community. Nestled among the rest of Arbor Ridge’s new homes and residential amenities are two Green House homes, which have been built from the ground up to deliver the highest quality skilled-nursing care in a setting that looks and feels — both inside and out — like a real home. Both homes are operated by St. John’s Home, (right) and each provides a home for up to 10 elders, each with private rooms and bathrooms. Elders set their own schedules, eat home-cooked meals made in the home’s open kitchen, and share good company by the fire in a real living room. Just as in one's own home, there is no visible nursing station, and medical equipment is hidden away. Nevertheless, Green House elders get all of the high-level health and personal care available in traditional nursing homes. Comparatively, they actually have better clinical outcomes and receive four times as much social and personal contact from staff. And all of this is no more costly to the provider, builder or residents than the average traditional nursing facility. Ten years have passed since the Green House Project (GHP) opened its first home. Today, there are 141 certified homes operating in 22 states around the country. But the Arbor Ridge Community is the first decentralized, community-based project that GHP ever opened. It’s certain that it won’t be the last. Cooking at Providence Seward Mountain Haven, Seward, Alaska, which uses the Green House model. Last year, the Robert Wood Johnson Foundation conducted a survey of more than 1,000 informal caregivers to determine what mattered most to them when it came to choosing long-term care for their family member. They overwhelmingly said that they were concerned about their family member losing a sense of dignity and independence.For those reasons, they said that they preferred in-home care to other options. Once they learned about Green House homes, caregivers were quick to voice their approval. More than half said they would pay more for such an option. Nearly three in four said they would drive further. Caregivers whose loved ones had in-home care said they liked the Green House option “a lot better.” Almost everyone said it was important for local providers to build more Green House homes. The enthusiasm among informal caregivers doesn’t just bode well for this market in the immediate future, but also in the longer term, when millions of boomers will need care themselves. Surveys show that as boomers age, they will greatly value — perhaps more than any prior generation — the independence and amenities that a home setting affords. Builders and developers may be intrigued about the business development opportunity that Green House homes present — but unsure of how to pursue it. The easiest and most important first step is for a builder or developer to become a resource to long-term care providers in the local area market. multi-level approach for their Green House. Click for a floor plan. The average local provider may have an aging physical plant that is expensive to maintain, often 30 years old, and not what the market wants.Its occupancy is likely down — average nursing home occupancy in 2009 was 89.5%. It’s clear that the facility needs an updated approach, but management doesn’t know where to start, and the idea of a major development project, especially one as innovative as the Green House model, can be overwhelming. A respected local builder who knows where to start could be exactly what a provider needs to move forward. That’s where 50+ builders and developers come in — and where The Green House Project can help turn them into a standout resource and development partner in their markets. Once providers become interested in The Green House model, they will likely have questions about how to build, finance, or operate it. The Green House Project team is standing by to help prepare for these conversations, to provide the resources that both builders and their potential project partners will need, and to facilitate the next step. The provider could act as a partner who can operate, and potentially own, Green House homes within a new residential development, or as an infill project within an existing neighborhood. just added a Green House to its campus. One or more Green House homes easily can be added to most CCRC or nursing home campuses. 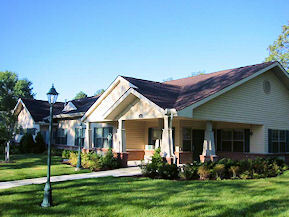 For new locations, typically four Green House homes are needed to meet the economies of scale required to operate a separately licensed nursing home. The business case for adding Green House homes is a strong one for existing nursing home providers. In an average implementation, providers may achieve equity returns of 13-20%. The financial research that GHP has conducted can strengthen the case a builder might make to a provider. For new residential developments, the Green House model offers a unique amenity for marketing an active adult community. It’s likely that nearby developments have never even considered including a nursing home. Why would they? Traditional nursing homes, with their intrusive loading docks and their enormous commercial structures would never fly in a residential community. However, having an attractive place for parents and grandparents to live close by that includes state-of-the-art long-term care will provide a significant differentiator for boomers who want to move, but wonder how they will provide good lives to their aging parents if and when they need nursing home care. While adding Green House homes to a new residential development is a unique business proposition, it can face zoning challenges that nursing campuses do not. But GHP’s experience shows that even those challenges can be successfully managed. The two simplest approaches are to build on property already zoned for health care use, or to propose a planned unit development, or PUD. One of the most creative approaches is to build between a nursing campus and a residential community. Green House homes can serve as the ideal buffer, acting as a transition between a campus and a community. For example, in Redford, Mich., Green House homes (right) sit across from a row of residential homes, separating the neighbors’ homes from the main campus of Presbyterian Villages of Michigan, the larger, traditional facility located behind the Green House homes. Another approach is to seek an exception from the local zoning board to rezone a residential property. While this may seem daunting, it is GHP’s experience that most local communities embrace Green House projects when they’ve been proposed at public meetings. Why wouldn’t they? Green House homes are small-scale, aesthetically appealing, and backed by a large body of evidence that shows they truly improve local lives. And these days, demand for such services is great, and growing. Whatever approach is taken, the expectation is that total development costs will run between $1-3 million per house, depending on the amenities and local building conditions. The average project has between four and six homes, but can have as few as one — as a part of an existing facility — and as many as 24. As America’s population rapidly ages, communities must increasingly offer a mix of housing options, and that includes long-term care for those who can no longer care for themselves. Like parks and good schools, Green House homes have the potential to not only to improve individual lives, but also to enhance whole neighborhoods. They are a practical way to meet the needs of families today — and in the years to come. The biggest barrier of all in areas where no or few Green House homes exist is simply a lack of awareness. It’s time to start a conversation with a local provider about the Green House model, its flexibility, and its feasibility. The results can be surprisingly positive. Robert Jenkens, MSRED, is the Managing Director for Aging and Independence at NCB Capital Impact, which administers The Green House Project. Jenkens and NCB Capital Impact work to develop and spread new models of long-term care that improve quality, satisfaction, and affordability through innovations in policy, development, and operations. To find out more about what this effort, visit www.thegreenhouseproject.org or email Maura Porcelli at mporcelli@ncbcapitalimpact.org. The Green House Model: The Next Lifestyle Amenity? Wellness: An Amenity, or a Way of Life? Kitchen Lighting: How Do I Get It Right? Reshaping and Enriching our Communities. If you having problems receiving our communications, see our white-listing page for more details.